We often receive all kinds of image files from all sources( the boss, friends and colleagues). In the work time, we can not spare so much time to check them one by one. Meanwhile some of the image formats, we can not open them on our computer. Is there a way which can make the image file collecting easy? If you already your own way and you feel it is best for you, please ignore this article. If you do not have up to now, please read this article. I recommend you a software which can convert image to PDF and combine all the image files in one PDF file if you like, you can also edit property of PDF file. It is Image2PDF OCR. By Image2PDF OCR, you can get the most accurate OCR results available to the production imaging marketplace while minimizing PDF file size with full compression and retaining original image and text layout. Then I will show you the detail steps to use Image2PDF OCR. 2. 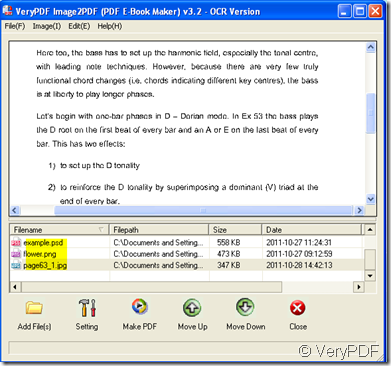 Add the image file(s) to Image2PDF OCR. When you see the icon of this software show up on the desktop, double click it then you will enter the interface of Image2PDF OCR. It can convert the image to PDF. I will take some of the image files for example. 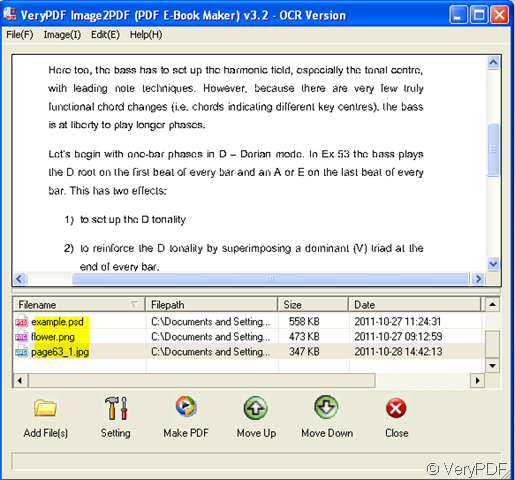 By Image2PDF OCR, convert all the image files to one PDF, then edit property of this PDF file. 3.How to edit property of PDF file. 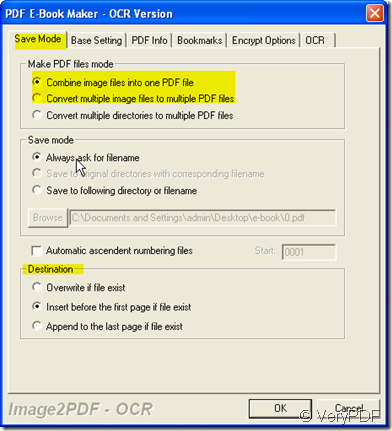 As you want to combine all the image files to one PDF, please click “Setting” then go to “Save Mode” label to make it. It is not hard to find this item “Combine image files into one PDF file”. At this label, you can also choose the “Save mode” and “Destination” of the PDF file. If you have finished the setting, click the button ok to end it. If you have finished the whole setting for your PDF file, please click the button “Make PDF” to end the conversion. A few seconds later, then you will find all the image files are kept in a PDF file. Then you can copy all the content of the image file to other document. Do you know how to convert GIF to PDF? If I do not install Adobe, can I use Image2PDF? This entry was posted in Image to PDF Converter and tagged edit property, image to PDF, Image2PDF OCR. Bookmark the permalink.